Ledger Nano S Cryptocurrency Hardware Wallet. New in Box. 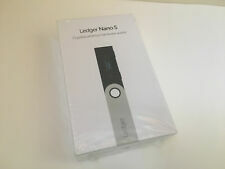 Ledger Nano S Cryptocurrency Hardware Wallet. New in Box. Ready to Ship!!! Ledger Nano S! Cryptocurrency Hardware Wallet! Original Wallet! Fast Shipping!!! Trending at $50.45Trending price is based on prices over last 90 days.